For the current pageant, see Femina Miss India 2018. The reigning Femina Miss India (Femina Miss India World) titleholder is Anukreethy Vas who was crowned by the outgoing titleholder Manushi Chhillar. The first Miss India was Pramila (Esther Victoria Abraham), from Calcutta, who won in 1947. It was organised by the local press. In 1952, two Miss India pageants were held, Indrani Rehman and Nutan were the winners of the pageant. Nutan was crowned as Miss Mussorie. The pageant was held by the local press. Indrani Rehman was crowned at Brabourne Stadium in Mumbai in the month of April 1952. Indrani later represented India at Miss Universe 1952, the inaugural edition of Miss Universe pageant. In 1953, Peace Kanwal from Punjab was crowned Miss India 1953 at KARDAR-KOLYNOS Pageant. The pageant was organised by Abdur Rashid Kardar. She later established herself as a Bollywood actress. In 1954, Leela Naidu from Maharashtra was declared Miss India, and the same year was featured in Vogue magazine's list of the world's ten most beautiful women. There was no Miss India pageant from 1955 to 1958. In 1959, Eve's Weekly organised its very first Miss India contest called Eve's Weekly Miss India to send India's representatives to the Miss World pageant. Fleur Ezekiel was crowned the eventual winner. She represented India at Miss World 1959 held in London, United Kingdom. The first ever Femina Miss India pageant was held in year 1964. Meher Castelino Mistri of Maharashtra was crowned the first ever Femina Miss India. She was chosen to represent India at Miss Universe 1964 held in the United States and Miss Nations 1964 held in Spain. Reita Faria was the first Miss India ever to win any international beauty pageant. She was crowned Miss World 1966 in London, United Kingdom. She was the winner of Eve's Weekly Miss India contest. The same year Femina Miss India winner Yasmin Daji represented India at Miss Universe 1966 and was crowned 3rd Runner Up at the event. She was the first ever Femina Miss India Winner to get placed at any international beauty pageant. In Earlier days, Femina Miss India used to crown three contestants, the winner used to represent India at Miss Universe and the runners-up were sent to Miss Asia Pacific and International Teen Princess. Later the second runner up represents India at Miss Teenage Intercontinental. On some occasions the 2nd Runner up or a finalist was sent to Queen of Pacific pageant from 1969 to 1975. Zeenat Aman was the first ever Femina Miss India titleholder to win an international pageant. She was crowned Femina Miss India Asia Pacific and went on to win Miss Asia Pacific 1970 held in Philippines. Later, after acquiring the rights to send India's representatives to Miss World, Femina Miss India used to select three winners who were then sent to Miss Universe, Miss World and Miss Asia Pacific International pageants, respectively. In 1991, Femina also acquired the rights to send India's representatives to Miss International pageant and on some occasions the third winner represented India at Miss International and a finalist was sent to Miss Asia Pacific International or else the third winner was crowned as Femina Miss India Asia Pacific and used to represent India at Miss Asia Pacific International and a finalist was sent to Miss International. In 1994, after India's historic win at the International pageants, the organisation ended the practice of crowning a single winner and instead decided that the top three winners were designated as winners with equal visibility and prizes. In 2002, the third winner was designated to Miss Earth instead of Miss Asia Pacific. In 2010, after the I Am She - Miss Universe India acquired the rights to send India's representatives to Miss Universe, Femina Miss India crowned three winners as Femina Miss India World, Femina Miss India Earth and Femina Miss India International, the third winner representend India in Miss International pageant. In 2010, Tantra Entertainment Pvt. Ltd. (TEPL), in partnership with Sushmita Sen, started a new pageant called I Am She – Miss Universe India. The winner of this pageant participated in the Miss Universe pageant from 2010 to 2012. In 2013, The Times Group again acquired the rights to send India's representatives to the Miss Universe pageant and started a new pageant called Miss Diva. The first ever Miss Diva pageant was held in Mumbai on 5 September 2013. Manasi Moghe of Maharashtra was crowned Miss Diva Universe 2013. Manasi represented India at Miss Universe 2013 and placed in the top 10. Gurleen Grewal from Punjab was crowned Miss Diva International 2013. She represented India at Miss International 2013. Miss India has been participating in the Miss Universe pageant since 1952, starting with Indrani Rehman and in the Miss World pageant since 1959, starting with Fleur Ezekiel. Historically, the Femina Miss India pageant sent the winner of the pageant to the Miss Universe pageant and a runner up to Miss Asia Pacific pageant and on some occasions the 2nd runner up used to represent India at International Teen Princess contest, whereas Eve's Weekly, a rival women's publication sent the winner of its Miss India contest to Miss World and Miss International. In the 1970s, Femina acquired the rights to send a representative to Miss World as well, and started to send the winner to Miss Universe and the runner-up to the Miss World contest. Later in 1991, Femina Miss India also acquired the rights to send India's representatives to Miss International pageant. In 1994, following India's historic dual wins at both Miss Universe and Miss World, the custom of crowning a single winner was discontinued. Instead, the top three placers were designated winners with equal visibility, equal prizes and responsibilities, and were crowned as Femina Miss India-Universe, Femina Miss India-World, and Femina Miss India-Asia Pacific and a finalist was sent to Miss International. In 2002, the third title was changed to Femina Miss India-Earth, to designate India's representation at the newly launched Miss Earth pageant, focused on the cause of environmental advocacy and a finalist was sent to Miss International. From 2007 to 2009, three equal winners were selected going to Miss Universe, Miss World, and Miss Earth. In 2010, I Am She - Miss Universe India acquired the rights to send India's representatives to Miss Universe. Later, in 2013 The Times Group again acquired the rights to send India's representatives to Miss Universe and launched a new pageant for Miss Universe named Miss Diva. In 1970, Zeenat Aman won Miss Asia Pacific 1970. She became the first Indian and South Asian woman to win the title. The awards for 1989 were given at the end of the year (December); hence there was no separate contest for 1990. In 1994, Sushmita Sen won the Miss Universe title after winning the Miss India crown and became the first Indian woman ever to win the Miss Universe crown. The same year the runner-up of Miss India, Aishwarya Rai, won the Miss World title. Sushmita Sen and Aishwarya Rai established themselves in the Bollywood industry after winning their titles. The success of Sen and Rai spawned coaching institutions which were set up to groom young women in pageant participation skills. The number of participants in the preliminary rounds of the pageant has increased considerably. Miss India World 1997, Diana Hayden won the title of Miss World 1997. In 1999, the Miss India World Yukta Mookhey went on to win the Miss World that year. In 2000, three of the Miss India winners won their respective international pageants — Lara Dutta (Miss Universe), Priyanka Chopra (Miss World) and Diya Mirza Miss Asia Pacific. The other country to have won all three major titles in one year were Australia in 1972. In 2010, after the introduction of I Am She - Miss Universe India, the third title was changed to Femina Miss India-International and the winner represented India at Miss International pageant. In 2010, Nicole Faria became the first Indian to win the Miss Earth title in Vietnam, which leaves Miss International as the only major international pageant that has not been won by an Indian contestant. In 2012, Himangini Singh Yadu won Miss Asia Pacific World 2012 and became first Indian and Asian to win the pageant. She was sent by I Am She - Miss Universe India pageant. In 2013, Srishti Rana won Miss Asia Pacific World 2013 giving India a rare back to back victory. She is the second Indian and first Miss Diva Winner to win Miss Asia Pacific World Crown. She is also the first ever Indian delegate to win an international pageant that has been sent by Femina Miss India's sister pageant, Miss Diva. In 2014, Asha Bhat, Miss Diva Supranational 2014 won Miss Supranational 2014 and became the first ever Indian woman to win the crown. Asha is the second Asian to win the crown. The same year Ruhi Singh who was crowned the first ever Femina Miss India Universal Peace and Humanity won the first ever Miss Universal Peace and Humanity pageant held in Lebanon. After May Myat Noe, the winner of Miss Asia Pacific World 2014 pageant was dethroned, the organisation organised another pageant named Miss Asia Pacific 2014 Supertalent of the World Season 5 under Miss Asia Pacific World title, Swetha Raj who represented India won the crown, giving India a rare back to back to back victory, India is the only country to win any international pageant three years in a row, however Swetha was sent by Miss India Australia organisation. On some occasions the top finalists have represented India at some other international pageants like Miss Heritage, Miss Tourism International, Miss Tourism. Femina Miss India also sends representatives to other international pageants like Miss United Continent and Miss Universal Peace and Humanity. Miss Grand International 1 2015 Vartika Singh ! ° In 1966 India won Miss World but the representative was sent by Eve's Weekly Miss India organisation. ^ In 2012 India won Miss Asia Pacific World 2012 but India's representative was sent by I Am She - Miss Universe India organisation. Asha Bhat (Miss Supranational 2014), Srinidhi Ramesh Shetty (Miss Supranationall 2016) and Srishti Rana (Miss Asia Pacific World 2013) were the winners of Miss Diva not Femina Miss India. In 2008, president of Gladrags, Maureen Wadia, served a legal notice to the newly crowned Pantaloons Femina Miss India Earth 2008, Harshita Saxena for violation of a two-year exclusive contract with Gladrags which had been signed by Harshita in 2006. To participate in any other beauty pageant, Harshita would need a written letter of no-objection from Gladrags. Harshita gave up the title and the crown passed on to Tanvi Vyas who represented India in the Miss Earth 2008 pageant held in November 2008. Harshita was later placed fourth in Miss India 2009 and represented India in Miss International 2009. In 1989, the winner Kalpana Pandit was found to have misrepresented her nationality (she was holding an American passport); she was stripped of her title and Dolly Mihas was declared winner. In 2004, Lakshmi Pandit (sister of Kalpana Pandit) was initially declared as the winner but had to return the title as she was married (to Siddarth Mishra); Sayali Bhagat was ultimately declared as the winner. The following women have represented India in the Big Four international beauty pageants, the four major international beauty pageants for women. These are Miss World, Miss Universe, Miss International and Miss Earth. India did not compete in the Miss Universe pageant from 1953 to 1963. I AM She – Miss Universe India sent its delegates to Miss Universe from 2010 to 2012. Traditionally the Miss India Winner was sent to Miss Universe and the runner up was sent to Miss World; however since 2013 a separate pageant Miss Diva has been held to send delegates to Miss Universe and the Miss India winner will represent India at Miss World annually. Urvashi Rautela Uttarakhand Dethroned as she could not meet the minimum age requirement. India did not send delegates in 1967, 1965, 1964, 1963. From 1959 to 1966 representatives to Miss World were sent by Eve's Weekly Miss India pageant. In 1968, Bharat Sundari got the franchise to send India's representative to Miss World. They sent the delegates from 1968 to 1970, 1972, 1975. Femina got the franchise in 1976. Femina also sent delegates to Miss World in 1971 and 1974. Traditionally the runner up in Miss India pageant was sent to Miss World but this changed in 2013 and now the winner of Miss India is sent to represent at Miss World. 1976 Naina Balsavar Maharashtra Withdrew in protest against the presence of two South African entries - one white and one black - in conformity with the apartheid policy of racial separation. Femina Miss India and Miss Diva (The Times Group) acquired the rights to send India representatives to Miss Supranational only from the year 2013. In the years 2011 and 2012, contestants were selected by Indian Princess pageant. In the years 2013 and 2014 India's delegates to Miss Grand International were sent by Indian Princess. Femina Miss India acquired the franchise in 2015. The representatives for Miss United Continents have been selected by Femina Miss India since the pageant's inception in 2013. Femina Miss India dropped the franchise of Miss International in 2015. The last representative to Miss International from Femina Miss India was Jhataleka Malhotra in 2014. India did not send delegates to Miss International in 1963–1967, 1972, 1977, 1989, 1990. 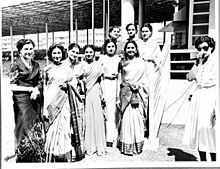 From 1960 to 1988 Eve's Weekly Miss India sent India's representatives to Miss International pageant. In the year 2013, Miss Diva winner was sent to Miss International. Femina Miss India had the Miss Earth Franchise from 2001 until 2014 with Alankrita Sahai being the last representative from Miss Diva. In 2015 Glamanand Supermodel India obtained the rights to send India's representatives to Miss Earth. In 2014, Miss Diva winner was sent to Miss Earth pageant. In the years 2011 and 2012, I Am She - Miss India sent their runners-up to this pageant. Femina had franchise to select their representatives in the years 2013 and 2014. 2014 Swetha Raj Miss Asia Pacific World 2014 - Season 5 Miss Talent Competition held to select a new titleholder for the year 2014. India is the only country to win an international pageant three years in a row. In the year 2012, Himangini Singh Yadu was crowned as Miss Asia Pacific World 2012. In the succeeding year Srishti Rana was crowned as Miss Asia Pacific World 2013. In the year 2014, May Myat Noe of Myanmar was originally crowned but later she was dethroned. A new pageant was held by the organizers and Swetha Raj of India became victorious, thus giving India a rare Three-peat victory in an international pageant. Indian representatives to Miss Intercontinental is being sent by Femina Miss India group. ^ "Yamaha Fascino Miss Universe India". EE Business. 2 July 2018. ^ "What are the differences between Miss Universe and Miss World". Narada News. 6 June 2016. ^ "rediff.com: Meet Pramila, the first Miss India". ^ "Jewish Stars of Bollywood - Jewish World Features - Haaretz - Israel News Haaretz.com". ^ a b "Indrani Rahman Was Married With A Kid When She Went On To Represent India At The First Miss Universe". Indiatimes. 19 May 2016. ^ "Nutan's granddaughter Pranutan Bahl is raring to go the Bollywood way". HindustanTimes. 9 March 2017. ^ "Stunning Photographs Of Indrani Rahman, India's First Miss Universe Contestant". 26 July 2016. ^ Mihir Bose (9 May 2008). Abdul Rashid Kardar: A History. Roli Books Pvt. Ltd. pp. 240–. ISBN 978-93-5194-045-6. Retrieved 22 March 2015. ^ "Peace Kanwal Complete Filmography". BollywoodMDB.com. Retrieved 11 February 2018. ^ "Leela Naidu: Miss India of 1954 who went on to forge a career as an actress with a touch of Western elegance". www.independent.co.uk. The Independent. 20 September 2009. ^ "Presenting you The first Femina Miss India – Meher Castelino Mistry". 24 March 2015. ^ "Not Just a Pretty Face: Reita Faria, the first Asian to win Miss World". The Indian Express. 18 December 2016. ^ "Yasmin Daji, a medical student from Delhi, not only won the Miss India but was a runner-up in Miss Universe". Times of India. 23 March 2013. ^ "Femina Miss India: 1964-1970". Times of India. 16 January 2013. ^ a b "Miss India Winners 1970 - 1964". Times of India. Retrieved 11 February 2018. ^ "The Bold and Beautiful: Zeenat Aman Miss Asia Pacific 1970". Retrieved 11 February 2018. ^ "From 1966 to 2017, the answer last that made India win Miss World". Times of India. 23 November 2017. ^ "Catch-Up With The Past Miss Indias". The Times Of India. 25 December 2010. Archived from the original on |archive-url= requires |archive-date= (help). ^ "50 YEARS OF MISS INDIA: HIGHS AND LOWS!". Times of India. 24 March 2013. Archived from the original on 27 March 2013. Retrieved 24 March 2013. ^ "Femina Miss India 2002 photo gallery". Times of India. 25 September 2007. ^ a b "30 contestants gear up for Miss Universe". Hindustan Times. 30 April 2010. Archived from the original on 3 May 2010. Retrieved 17 May 2010. ^ "Miss Diva 2013: Manasi Moghe wins the title - Beauty Pageants - Indiatimes". indiatimes.com. Retrieved 18 February 2018. ^ "Fifty years of Miss India". Times of India. 24 March 2013. ^ "The Hindu News Update Service". The Hindu. 9 April 2007. Archived from the original on 29 June 2011. Retrieved 17 May 2010. ^ "No runners-up in Miss India contest; all 3 winners are equal". Daily News and Analysis and Press Trust of India. Press Trust of India. 9 April 2007. Retrieved 1 March 2012. ^ "Zeenat Aman : Miss Asia Pacific 1970". Retrieved 11 February 2018. ^ "The Hindu Business Line : Coke-Sushmita Sen deal cancelled". Thehindubusinessline.in. 16 July 2003. Retrieved 24 October 2011. ^ Hiscock, Geoff (2007). India's global wealth club. John Wiley and Sons. p. 6. ISBN 0-470-82238-4. ^ "Meet the Biggest Movie Stars on the Planet (You May Not Have Heard Of)". The Oprah Winfrey Show. 28 September 2009. Retrieved 28 March 2017. ^ "Biography of Diana Hayden". DianaHayden.com. ^ "Not films, birthday girl Yukta Mookhey hit the headlines for this!". Daily Bhaskar. 26 October 2015. ^ "Miss Universe vs Miss World: Facts and comparisons". MSN. 15 January 2015. ^ "Nicole Faria's family not surprised by Miss Earth win". dnaindia.com. 5 December 2010. ^ "Srishti Rana wins Miss Asia Pacific World 2013 Beauty Pageant". Biharprabha News. ^ "India's Asha Bhat is the first Indian to win Miss Supranational 2014 title". ibnlive.com. ^ "Ruhi Singh: The lights-camera-action call is my happiest moment". ^ a b "May Myat Noe dethroned amid theft claims". Myanmar Times=1 September 2014. Retrieved 1 September 2014. ^ "finalists 2013". missindia.com.au. Retrieved 11 January 2018. ^ "Ruhi Singh - Femina Miss India 2012 Contestants - Indiatimes.com". indiatimes.com. Retrieved 14 December 2015. ^ "Miss United Continents India 2016 is Lopamudra Raut !!". 29 August 2016. ^ "Haryana Girl Manushi Chhillar Crowned Miss World 2017". outlookindia.com/. Retrieved 24 January 2018. ^ "Miss India Earth to fight for crown in court – Movies News". ibnlive. 3 February 2010. Retrieved 17 May 2010. ^ "Pandit returns Miss India-World crown". Rediff.com. 31 March 2004. ^ Jun, Kwanwoo (3 December 2003). "Lost in Storm's Debris: A Beauty Pageant". The Wall Street Journal. Retrieved 9 November 2015. ^ Kenya, News (15 July 2011). "Beauty with scandals". Standard Digital News. Retrieved 9 November 2015. ^ Vietnam, News (8 October 2008). "Những scandal của Miss World". Vietnam Express. Retrieved 9 November 2015. ^ Ibrahim, Lynda (13 September 2013). "The misses and missuses of the world". The Jakarta Post. Retrieved 9 November 2015. ^ Lowe, Aya (25 January 2016). "Philippines' Miss Universe returns home, ignites dreams". Channel NewsAsia. Retrieved 25 January 2016. ^ a b https://www.facebook.com/naradanewslive. "What are the differences between the Miss Universe and Miss World pageants?". naradanews.com. Retrieved 18 February 2018. ^ "Photos: Asha Bhat is the first Indian to win Miss Supranational 2014 title". firstpost.com. Retrieved 2 March 2015. ^ "Asha Bhat crowned Miss Supranational 2014". indiatimes.com. Retrieved 2 March 2015. ^ "Meenakshi Chaudhary from India crowned 1st runner up at Miss Grand International 2018". indiatimes.com. 26 October 2018. ^ a b Srinjan Bhowmick (25 October 2015). "Vartika Singh crowned 2 runner-up at Miss Grand International 2015". BeautyPageants. IndiaTimes.com. Retrieved 28 February 2016. ^ "Evening Gown Pictorial + Tour of Miss Asia Pacific World 2012 Contestants". Missosology.org. Archived from the original on 4 April 2013. ^ "News18.com: CNN-News18 Breaking News India, Latest News, Current News Headlines". News18. Retrieved 18 February 2018. ^ "Miss Asia Pacific World 2012 Contestants & Final results". Missosology.org. Archived from the original on 4 April 2013. ^ "Indore girl wins Miss Asia Pacific 2012". ibnlive.in.com. ^ "Srishti Rana wins Miss Asia Pacific World 2013 Beauty Pageant". Retrieved 30 October 2013. ^ "'I didn't know I had been dethroned': Burmese beauty queen, 18, who ran off with $100,000 tiara refuses to hand it back until organisers apologise for calling her a 'thief'". MAILONLINE. 2 September 2014. Retrieved 2 September 2014. ^ "finalists 2013". missindia.com.au. Retrieved 4 January 2014. ^ "Miss India Australia - Facebook".